“He was big in all aspects, save resentment” declared his Lordship, who likened the dead Commander in Chief’s lifework to that of Joan of Arc. Dr Fogarty began by saying that the death of general Collins was to him a great sorrow. “I cannot think of him”, the Bishop said, “without emotion. His personal charm was irresistible, like his high commanding powers. “He was made by nature to conquer and to rule. In him the brave and the tender, the gentle and the strong were richly and beautifully blended. He had the heart of a lion, yet was as soft as a child. Had he lived in the Middle Ages he would have been a Coeur de lion, a knight of endless and dazzling romance. “He was big in all aspects of his character, save one, and that was resentment, of which he had none at all. I never heard him say a bitter word against the English, even in the blackest days of the Terror, nor of his unnatural enemies in this disgraceful conflict. “General Collins’ last words, “Forgive them”, are pathetic, but they are so like his noble nature. I need not speak “, Dr Fogarty continued, “of his manifold abilities, his resourcefulness, quickness of decision and indomitable will. His almost incredible achievements in the short spell allotted to him will be an emblazoned witness to the world and time. “it seems but a day since he burst on the Irish stage like a youthful Samson, almost a boy, with his white face, royal mien and jet black hair; and in three years he transformed Ireland by his titanic energy, forcing England to relax her powerful grip on Ireland, and winning for his country a triumph which Hugh O’Neill in his heyday never dreamt of. Had he fallen at the hand of an external enemy we could have borne it, but that such a rich and bounteous nature, such a triumphant and romantic battler for Ireland’s cause, such a glory of our race and nation, such an idol of the people should be slain by a spiteful faction of our countrymen is a chagrin, a bitterness and a shame too heavy to bear. they are not men who shot a noble life away from behind a hedge. “inevitably we recall the history of Joan of Arc. She appeared suddenly, did her work for France, and disappeared almost in a day, burned to death by some of her own countrymen. “it seems to be God’s way that the flames that extinguished the heroine’s life did not destroy her work. So it will be with Michael collins – the work he did is indestructible; he gave us more than Orleans. “Sooner or later” continued the Bishop, “and the sooner the better, the people will get going in earnest, and when they do they will make short work of the wreckers. then will the heroic figure of General Collins tower high in glory; while they who contrived his death lie buried in shame. But meanwhile it is heartrending to witness the sorrow of the people. He was their idol, their ideal hero. His death, and the manner of it, has left them inconsolable. Never was such a flood of tears rained on an Irish bier, never have the Irish pipes wailed so piercingly for a stricken chieftain as they will when General Michael collins, maker and leader of Ireland’s victorious army, the hero of so many thrilling episodes, the trusted standard bearer of Ireland’s hopes and fortunes, that gained for himself and her the admiration, one might say, of all the world, will be laid to rest beside President Arthur Griffith in Glasnevin. “But”, the Bishop concluded “let the people dry their eyes that grave is lined with Christian hope. 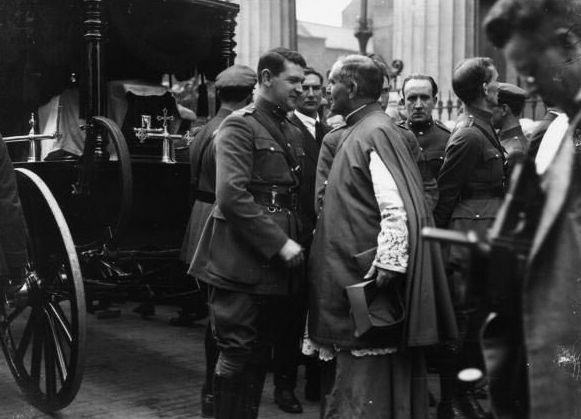 As sure as Michael Collins will rise again from the dead on the Last Day, so sure will the Ireland he lived and died for rise, and rise soon please God from her present woes to peace and prosperity”.